This recipe pairs baked cod with delicious summer vegetables for a flavorful and highly adaptable dish that’s filled with cancer-fighting ingredients! When it comes to nutrition, cod is particularly rich in protein, selenium, and phosphorus. A single 100-gram filet provides more than 35% of the protein you require each day, as well as just 80-90 calories and very high levels of omega-3 fatty acids. 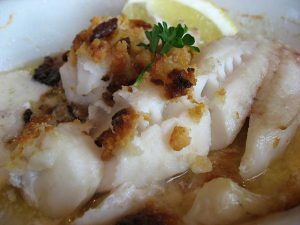 This fish is also a good source of This recipe pairs baked cod with delicious summer vegetables for a flavorful and highly adaptable dish that’s filled with cancer-fighting ingredients!, among others. The selenium and vitamin B12 found in cod can reduce the risk of the development of colon cancer by protecting and repairing cells in the colon. Additionally, they help eliminate toxins and cancer-causing chemicals produced by gut bacteria. Consumption of this fatty fish also helps to ward off renal cell carcinoma, a common form of kidney cancer. Yellow squash is also rich in antioxidants that ward off free radicals. In particular, the high beta-carotene content offers protection from pollutants and chemicals that can cause cancer. and place in a 9×13-inch baking dish. 2. In a large bowl, combine tomato, bell pepper, squash, olives, garlic and black pepper. 3. Sprinkle with remaining 1 tablespoon olive oil and 1/2 teaspoon salt and toss to combine. 4. Spoon mixture over cod and bake until vegetables are tender and fish is just cooked through, 20 to 25 minutes. 5. Serve the cod and vegetables with some of the juices in the pan spooned over the top.